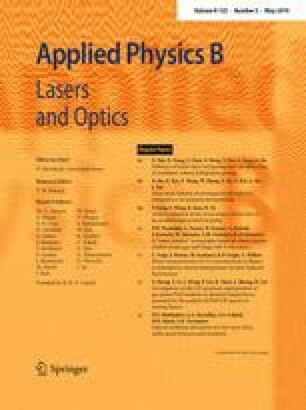 A novel Lagrangian interpolation-based direct laser absorption spectroscopy (LI-DLAS) technique was presented to suppress noise in infrared gas detection by incorporating Lagrangian interpolation and nonlinear least-square fitting (NLLSF). An LI-DLAS analyzer was reported for methane (CH4) detection using a 1654 nm distributed feedback (DFB) laser, a compact digital signal processor (DSP), and a multi-pass gas cell (MPGC) with a 16 m optical path length. The performance of the developed LI-DLAS CH4 analyzer was evaluated by means of laboratory experiments. Compared with the traditional DLAS-based sensor without Lagrangian interpolation, the detection sensitivity was improved from 6 ppmv to 2 ppmv, and the detection stability was enhanced as the Allan–Werle deviation was dropped from 1.514 to 0.531 ppmv for a 1 s averaging time. Compared with a DLAS analyzer based on LabVIEW platform, the DSP-based CH4 analyzer shows the merits of compact size and low cost with potential filed-deployable applications in industrial monitoring and control. The National Key R&D Program of China (No. 2017YFB0405300), National Natural Science Foundation of China (Nos. 61775079, 61627823), Science and Technology Development Program of Jilin Province, China (Nos. 20180201046GX, 20190101016JH), Industrial Innovation Program of Jilin Province, China (No. 2017C027), and the National Science Foundation (NSF) ERC MIRTHE award and Robert Welch Foundation (No. C0586) are acknowledged.